I'm not sure when I first saw this bug. I considered perhaps port forward had somehow not kicked in properly but that's something you'd expect from UPnP, etc. instead. 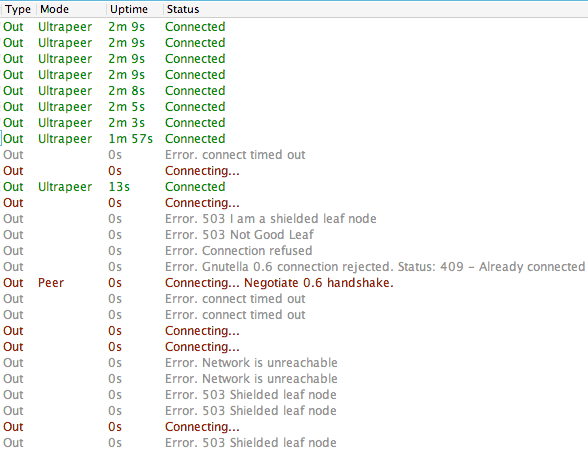 Occasionally, generally happening after I'm restarting Phex from a long session, Phex connects in Ultrapeer mode but is kicking off all leafs. 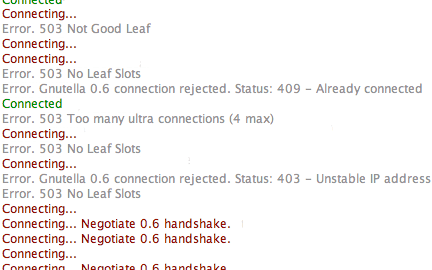 Error 503: No Leaf slots. 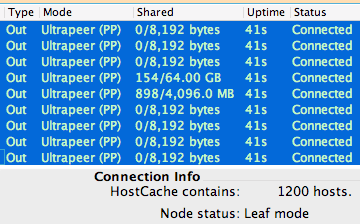 For some reason Phex is pushing off leafs despite declaring itself as an ultrapeer. The 'already connected' error messages might relate to WireShare also running. 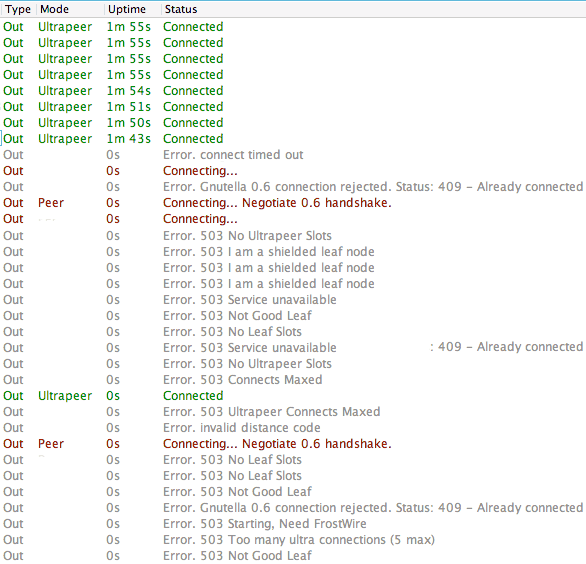 I verified at least a couple of same hosts as giving those error messages. One issue I've noticed over the past few years (not sure which year this problem started, perhaps 2015/16 but I think within the past 3 years) is G2 (mostly Shareaza) hosts inundating the phex.hosts file. Also, G2 appears to use or have switched to a different uptime/average or peak/session uptime system compared to G1. This is putting G2 hosts ahead of G1 hosts on the host file (read from bottom-up) and can dramatically slow Phex connecting to the network. Phex has traditionally been one of the very best and easiest programs to connect to the network when the program is not firewalled. G2 using an eight number uptime system compared to G1's five number system representing one day in seconds. I've often been using Sublime Text to delete all phex.hosts lines containing RAZA between sessions. Doing so means I connect very quickly (if not instantly) back to the gnutella network. It's surprising how many and how quickly g2 hosts end up back onto the host file when I check the file during a session. I’ve also seen listings of ENVY and PEER (PeerProject) and one other multi-network client. I am surprised Phex host file management system does not consider average uptimes greater than 86400 as illegal. (2) Divide the G2 hosts and other networks into a separate host file(s). Actually Phex should have a system to determine if it's ever connected to any other network and whether to collect hosts for those networks or not.